There is something about sparkly glitter slime that adds to the experience of making slime! Making glitter slime with clear glue is easy and if you want an even easier glitter slime recipe you can use glitter glue instead. 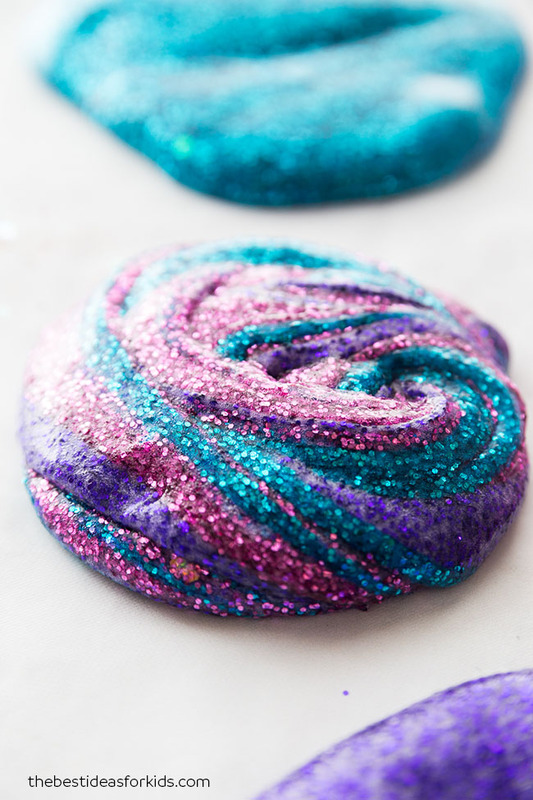 This glitter slime can be made in any color! 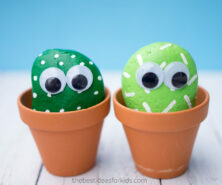 Choose any of your favorite colors to make this slime. This would be perfect to make for a birthday party, afternoon activity or even just for the slime fan in your house. We have a little obsession with glitter slimes. 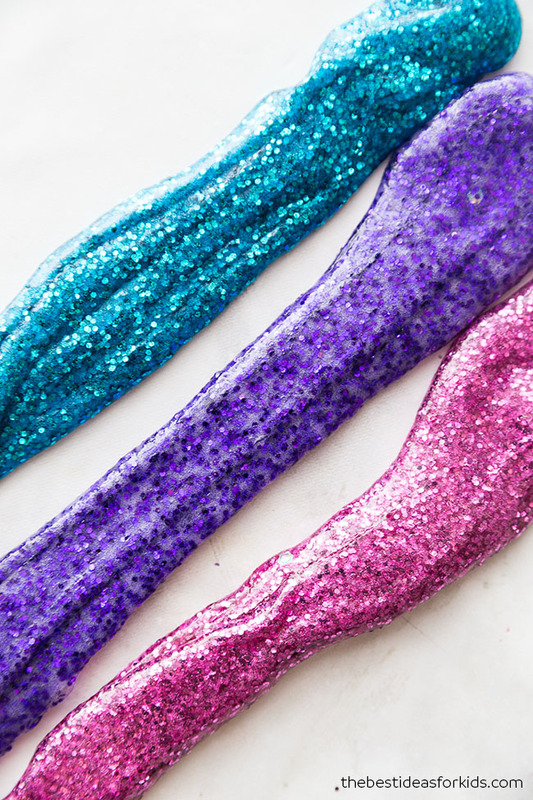 We’ve made glittery unicorn slime, mermaid slime, fairy slime and princess slime. 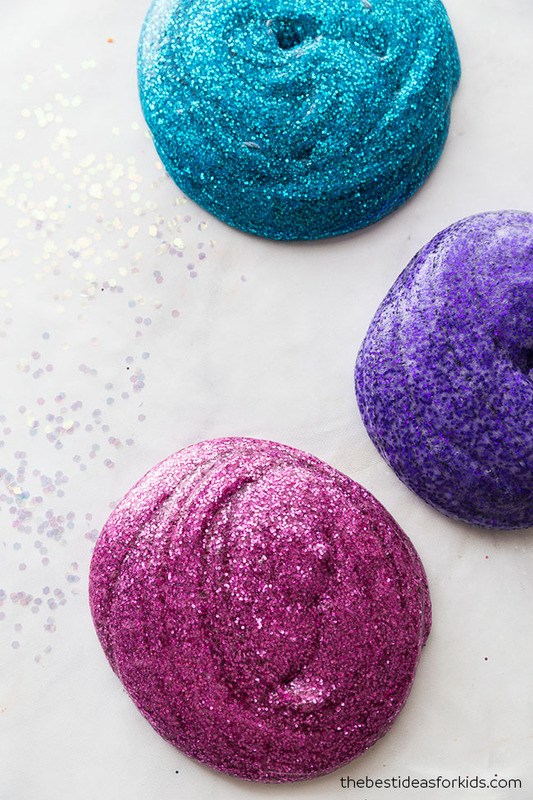 Adding glitter and color to your slime is a fun way to turn it into themed-slime for a birthday party! 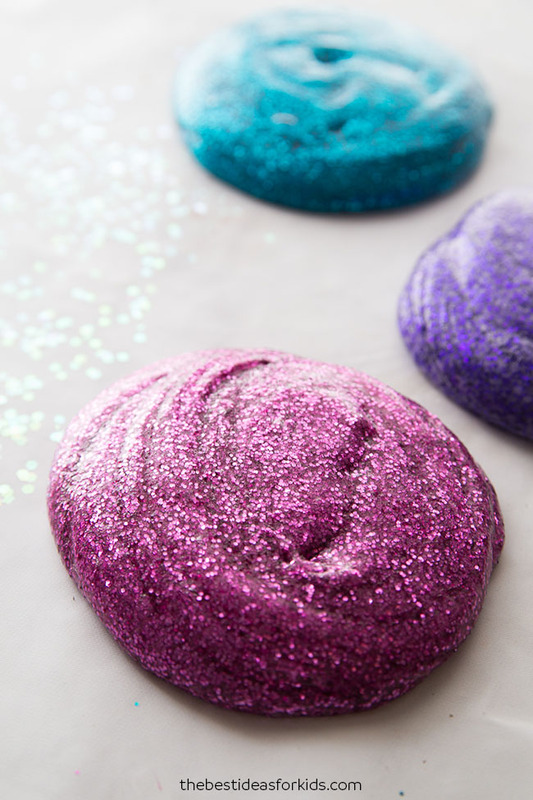 To make glitter slime from scratch, you’ll need clear glue, glitter (we like chunky or regular glitter, not fine glitter or it won’t show), contact lens solution, baking soda and water. See the full recipe down below. 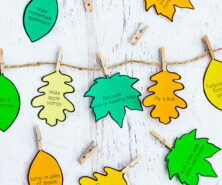 Biodegradable Glitter – If you’d like a biodegradable glitter option, we recommend this chunky biodegradable glitter from Etsy as an alternative. Note that this glitter will start to break down after a few weeks when exposed to any liquid. – Glitter – we like to use regular sized glitter because fine glitter will not show up in the slime. We used pink, turquoise and purple. – Liquid Food Coloring – this set comes with all kinds of vibrant pinks, purples and blues. – 1 – 1.5 tablespoons of Contact lens solution. **Important: your brand of contact lens solution must contain boric acid and sodium borate. We like this brand the best and use it in all of our slime recipes. See our full contact solution slime recipe for the brands we recommend. Do not substitute for any other brands. 2. Add 6 oz of clear glue to your bowl. 3. 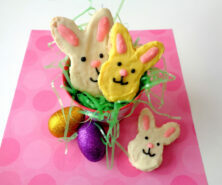 Add your food coloring in and mix. We used pink, blue and purple. This set comes with all kinds of vibrant pinks, purples and blues. 4. Add 1/2 teaspoon of baking soda to the bowl of water and mix. Then add in 2 tablespoons of water and mix. 5. Now add in your glitter. 6. Now slowly add in your contact lens solution until it starts to pull away from the bowl. Add one tablespoon to start and then mix. Mix slowly to not over-mix and cause too many bubbles. Once the slime starts to pull away from the bowl you can take the slime out and knead with your hands. It will still be sticky at this point and that is normal. Keep kneading for 5 minutes. The more you knead, the less sticky it should be. If you still find the slime to be too sticky after kneading for 5 minutes we recommend trying to add some baby oil or lotion to your hands first. That way you can makes sure you don’t over-activate the slime. If you’ve tried all of the tips above and it’s still too sticky, you can also add in another 1/2 tablespoon of contact lens solution. Add this in slowly, an extra teaspoon at a time and continue to knead until you find it to be a consistency you like. Now your slime is ready to play with! 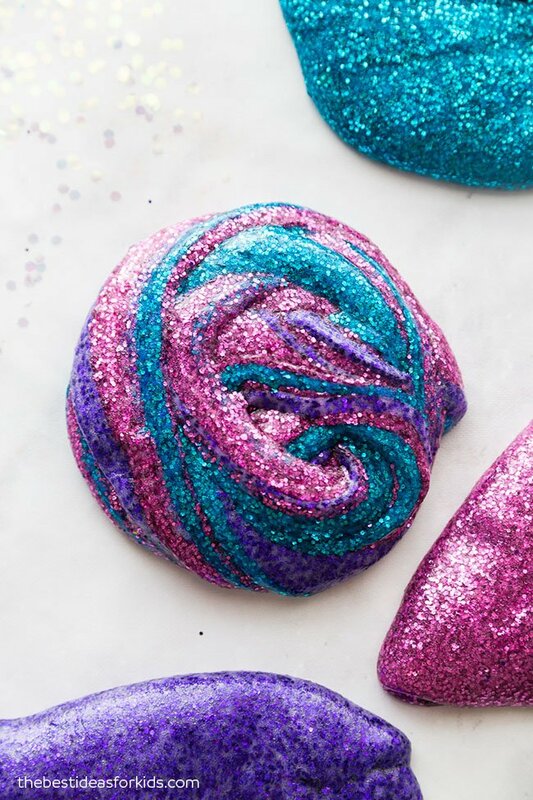 Kids will love stretching this glitter slime!